We've often written about how cool it is to meet new artists and discover new music, probably the best aspect of running a netlabel. And yet again we have the privilege of welcoming a new artist to Earth Mantra, this time Danish electronic maestro Kim Pedersen and his exceptional ambient music project Dreamhub. With his debut Earth Mantra album, entitled Moments in Space, Kim has produced a collection of utterly divine ambient space music. In fact, the word "cosmic" is particularly appropriate. Spanning over seventy minutes across ten tracks, there is a depth and sophistication to this album that really makes it stand out, some of the most tasteful and well considered space music we have heard in some time. Despite creating very tonal compositions, very light and melodic, he somehow keeps the music completely fresh and with a very distinctive point of view. Remarkably well done. Kim reports that his inspiration for this CD was "... definitely what you would call 'deep space'. I had a very certain feeling that it was time for me to follow a somewhat slightly darker and a bit more mysterious path than in my previous releases. Also, the more I dived into the sonic universe I created, the more I got hypnotized into actually being in a specific place out there and it just kept on inspiring me. However I constantly find myself using not purely electronic sounds - I always need this organic feel to it - a bit of grit, soul and that uncertain nature-influence." 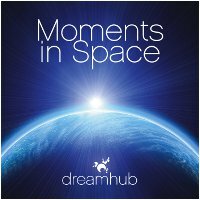 Earth Mantra is very proud to bring our listeners Moments in Space, the beautiful new album by Dreamhub. It is a magnificent journey through the cosmos, and one we think all of our listeners will enjoy immensely. Highly, highly recommended. Great sound for cosmic visions. Thanxx HM. Hello from tuscany, mystic and magic location. This really is space-ambient at its best: atmospheric, inspiring, and fun to listen to. The album has drifts, modest beats a là Carbon Based Lifeforms, and that great Schulze-esque analog sound. The album combines these three influences in a mature and restrained way. Definitely getting deeper into this one with each subsequent listen. Gorgeous spacemusic with a lot of thought behind it. I keep coming back to this one to hear more. Nice work, Kim! Fantastic album. I don't know what synthesizers or VSTi's this artist was using, but he managed to make really great soundrack of space. Lovely sweeps and pads and atmospheres. Truly amazing and inspiring job from Dreamhub. Thanks again, Earth Mantra, for this wonderful experience.